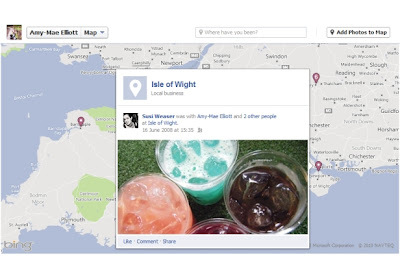 Now Facebook users can Add Captured Photos Location On Facebook Maps to let others know from where they have taken that particular photo. Facebook is now offering Map optimization to let users share their captured photos location via Facebook Maps with their friends and families. Adding captured photos on Facebook Map is a best way to show where you’ve been and what you're doing in your life. If you have already added and shared geographical data to images as you uploaded them via cell phone or desktop, they should already show on your Facebook Map page. If not, you can manually add Photos on your Facebook Map by following simple steps below. To Edit or Manage your Facebook Map, click on the "map box" on your Facebook Timeline favorites section. If you can't see a "map" box here, hit the down arrow to the right of the boxes to see the hidden boxes. Now click "Add Photos to Map" on the top right hand side of the maps screen. You'll now see your uploaded photos in a film strip-style display at the top of your map page. Clicking an image will give you a "Where was this?" text box. Start typing the location and you can select the correct one from the list that appears. When you've finished adding a location to the pics you want to geotag, click "Done Adding" to return to your normal map view. You can also add in a location when you're viewing a photo. Simply click "Add location" and start typing in the box. Select your location from the choices that appear. Once you've added locations to images, back in your map page you'll see new pin markers. If you click on the markers, you'll see the relevant image.